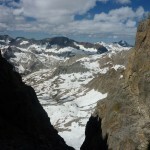 After a false start, I bagged Gilbert and Johnson, two of the peaks between the South Lake and Lake Sabrina drainages. 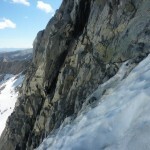 And for a change, I even did it in style, climbing the classic North (“Engram”) Couloir on Gilbert. Luckily it was a short day, because it was pouring rain and hail by 2:30, and it looks like the ever-sunny Sierra will see afternoon thunderstorms through the weekend. Blech. 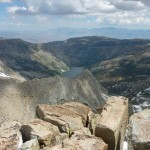 I got a leisurely 6:40 start toward Bishop Pass, then took the scenic Treasure Lakes turnoff. 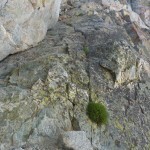 It was impossible to enjoy the scenery, though, since the mosquitoes were thick and thirsty until I got onto a bare granite ridge with a bit of wind around 11,500′ or 12,000′. I was finally able to stop, put on sunscreen, and have a snack. From the ridge, I realized I should have cut off one drainage earlier to get to Gilbert. 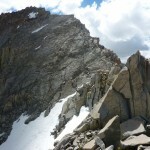 With so many spurs and subpeaks coming off the ridge, this area is surprisingly confusing. 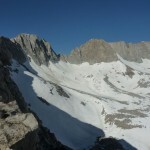 Fortunately, I reached the ridge near a break that, with a bit of 4th-class goodness, got me to the snowy, moraine-infested cirque below Gilbert and Thompson. After nearly eating it on some shadowed snow, I put my mountaineering crampons on my trail runners, and had an easier time of things until I got into the sun. After rain the previous afternoon and a warm night, much of the snow was sun-cupped mashed potatoes, so the traverse to the base of the couloir was, while easy, wet and discouraging. 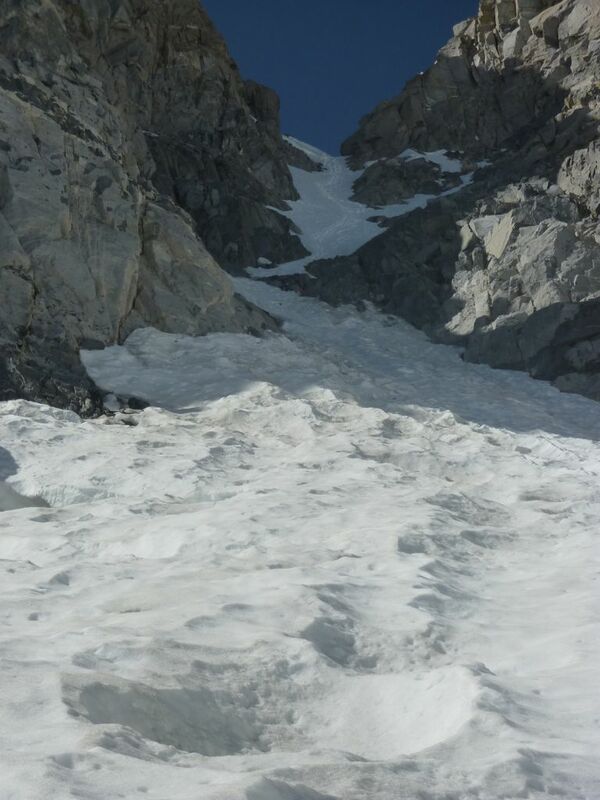 The couloir looked intimidatingly steep, but there was no visible water ice, so I figured it was worth a try. As the slope increased, I learned that front-pointing in trail runners feels extremely sketchy; I hadn’t realized before how important the half-shank in my mountaineering boots was for crampon work. 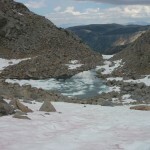 With boots and two tools, the mixture of hard snow and neve would have been a cruise; with trail runners and a mountaineering axe, I had to be a bit more careful, even dodging a tiny patch of water ice on the rock to one side. 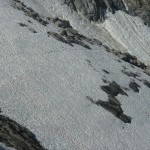 From the top of the couloir, there is a 5.6 direct route to the summit, and a 4th class bypass on slabs just on the other side. The 5.6 didn’t look as hard as its grade, but I went for the slabs, which were actually more like 3rd class, and soon found myself on the summit. 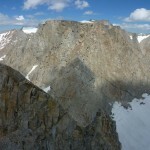 From Gilbert, I dropped down the west side of the ridge on sand and talus to below the saddle with Johnson, then made my way up ledges to the col. Climbing Gilbert this way would have been miserable, but the sand made for an efficient descent. 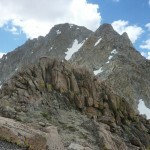 The climb to Johnson was an enjoyable class 2-3 cruise over rock and blocky talus, with a pleasant slabby finish. Despite the gathering clouds, I took the time to enjoy my fish here, then dropped down more sand to the south end of the Treasure Lakes drainage. 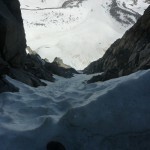 This descent would be miserable when dry, consisting of endless loose, low-angle talus, so the lingering snow was welcome. 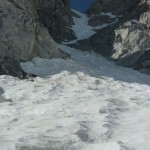 The suncups were even small enough that it was possible to boot-ski some parts. I was soon back at Treasure Lakes, and did not stop to take a mosquito census until I got to the car about 7 hours after I started.